To raise awareness of Foetal Alcohol Syndrome (FAS). To inform pregnant women (and their partners) about the risks of drinking alcohol during pregnancy. Maternal consumption of alcohol during pregnancy can harm the unborn child heavily. Every year about 2,000 children in Germany are born with fetal alcoholic syndrome (FAS). Another 10,000 are born with partial fetal alcoholic syndrome (pFAS) and alcohol-related neuro-developmental disorders. Pernod Ricard created the campaign because of the lack of knowledge about the risk of drinking alcohol during pregnancy. Posters: 2 nine foot by nine foot giant posters were placed on the Charité Hospital’s Virchow-Klinikum campus walls. 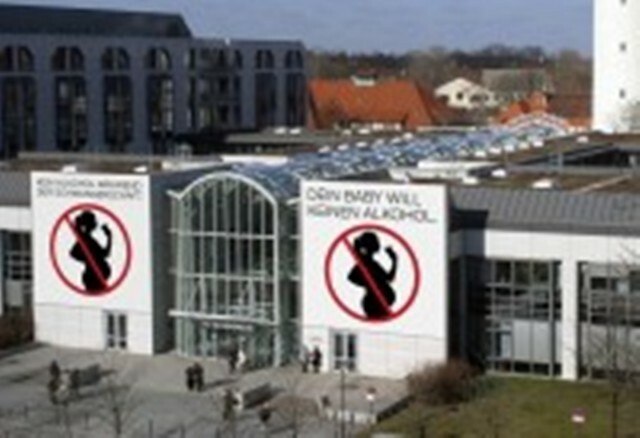 They show a barred pictogram of a pregnant woman with a wine glass her hand and carry the campaign tag line. 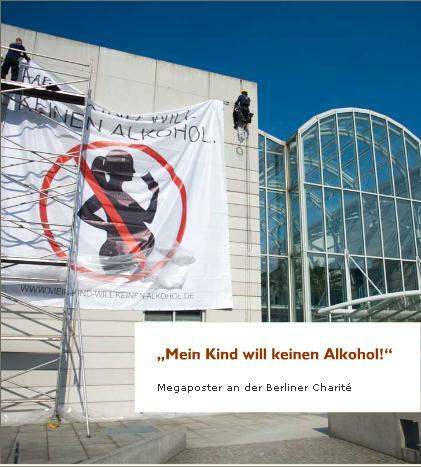 In November 2010 the posters were placed on billboards across Germany. The campaign message was also published in magazines. Celebrity Support: a variety of famous German females endorse and spread the "no alcohol for my baby" message through testimonials (Bettina Zimmermann, actress; Dorothee Baer, Member of Parliament; Bettina Wulff, current first lady; Franziska Knuppe, Model; Silvia Incardona, TV presenter; Sylvana Koch-Mehrin, Vice President of the European Parliament, Liz Baffoe, actress and Sophie Schütt, actress and leading personality of the campaign). Campaign video: In November 2010, a TV and online film was broadcast through various media channels in Germany. The video has been uploaded to the campaign website and to youtube. Online support: a website (which contains information on FAS: its causes, how to prevent it; the campaign video and short testimonials by the sponsor) and Facebook page. The website was updated in September 2015. It has new content and optics and technology have been improved: For example, the site is now optimised for mobile devices and is reflected in the new "look and feel". Since 2012, Pernod Ricard Germany receives research support from Professor Peter Mallmann from the University Hospital of Cologne. 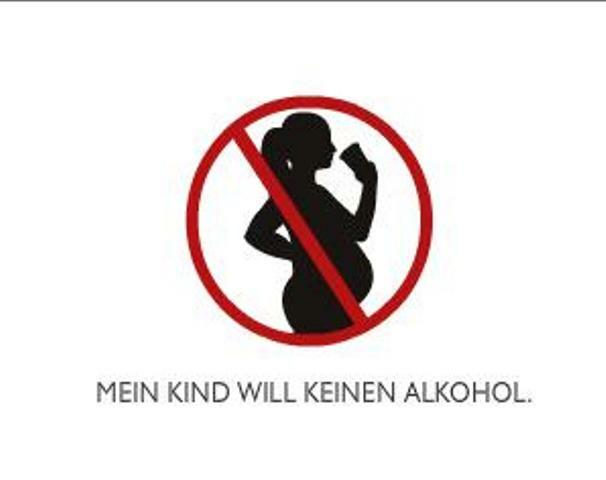 In addition to the campaign, all Pernod Ricard products have a pictogram showing that a pregnant woman shouldn't drink. As of November 2016, the Facebook Page has more than 4,200 "likes". The message was displayed on 3,000 billboards in 2010. The campaign was adapted and launched in Austria in 2011. It was honoured by the Health Media Awards in 2013. The award recognises successful and innovative communications and marketing activities in the health sector. The campaign received an award in the category of "campaigns" on June 28, 2013 at the Water Tower Hotel in Cologne. The Facebook page has over 4,100 "likes" (November 2015).